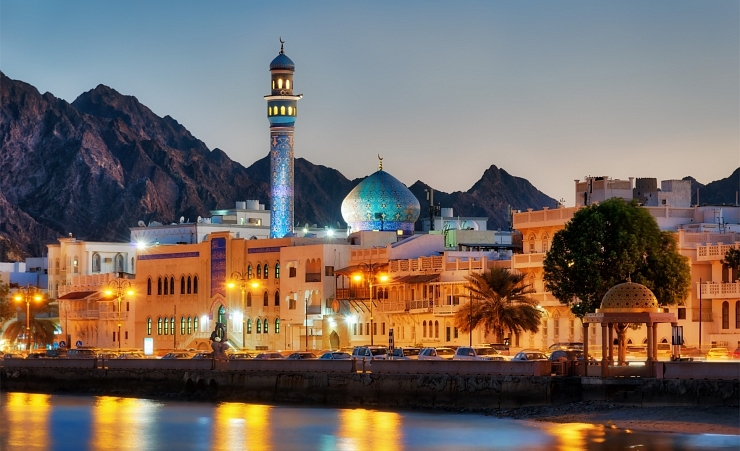 Muscat, Oman's capital city, showcases the very best that the country has to offer and all in one place. While there are traces of history evewhere here, there is some modern culture too, with shopping malls and luxury boutiques hidden alongside opulent buildings like the inspiring Sultan Qaboos Grand Mosque. 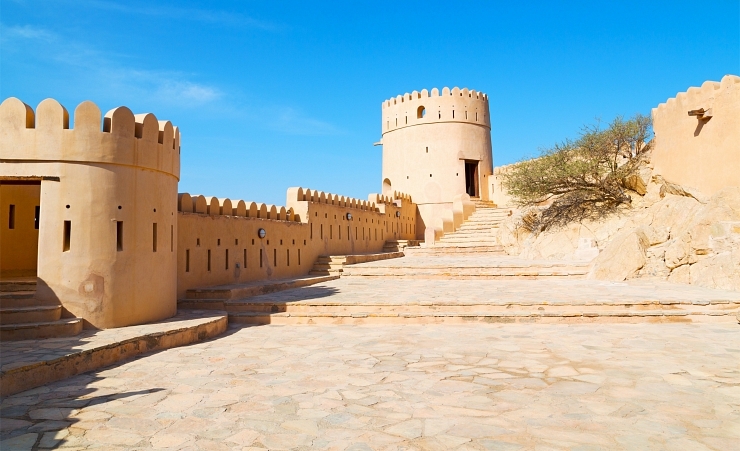 Oman has a hot and arid climate with especially hot summers when temperatures can reach as high as 40℃. Even winters are warm, with the average low in the mid-20s. With that being said, the best time to go is between October and April when temperatures are hot but not too hot. There are also a number of shopping options if that more suits your fancy. In particular, try the Oman Avenues Mall or Sabco Centre. For something more traditional, try Muttrah Souk, where you’ll find biggest a mix of spices, gold and silver. Those in search of grand architecture (or a show) should visit the Royal Opera House. Sultan’s Palace, although closed to the public, can also be admired. Its blue and gold mushroom pillars are hard to miss. The Grand Mosque, a symbol of moderm Islamdic architecture, is open to the public if you are dressed modestly and accordingly and Muttrah Corniche is well-worth a visit, especially around sunset when the light and shadows play on the landscape from the mountains. Muscat beaches are the perfect place to relax after sightseeing. Al Shatti Beach is the best and liveliest in Oman with golden sands and clear blue waters to enjoy. Qurum Beach is found at the edge of a nature reserve and is a long and sandy stretch. You can also take up jet skiing, parasailing or kayaking around here. For something more private, visit Al Bustan beach and resort, where you’ll be surrounded by mountains. You’ll see the marks of colonisation by the Portuguese along with the Ottoman Turks in the buildings they have erected throughout history. With plenty to see, we recommend you start with the Portuguese built Al Mirani and Al Jalali Forts which guard the capital's harbour. For one month each year usually at the end of January there is the Muscat Festival. It is the highlight of the year with fireworks each night, funfairs and street performances. You’ll find a wide variety of middle eastern and turkish cuisine here, along with Indian and European cuisine. Dates are the food of Oman, so head to Meshan Cafe to enjoy them with traditional Omani coffee. Or, you can visit the Al Bustan Palace Hotel for a luxurious afternoon tea, the best treat when in Muscat. Tourists tend to visit hookah lounges to smoke shisha with the locals when in Muscat. But, there are bars and clubs around, too. Just be sure to check out the dress code. And for those who don’t want to miss the sunset, head to Qurum Beach for a relaxing and romantic evening. For something unforgettable, venture out on a dolphin watching cruise that take off from the Marina Bandar al Rowdha. There are also trekking tours to the Oman Grand Canyon. You’ll fnd plenty of watersports on the beaches as well. Public transport in Oman is hard for visitors to understand, so it is best to avoid it. Taxis, therefore are a lot more popular. They can quickly be hailed from the side of the road and tend to be inexpensive. Driving yourself is also an option as all the road signs are in English. It is recommended that if you plan to leave Muscat and go off-roading, you rent a 4x4 instead.